Today the 16th of June is Bloomsday. James Joyce set his modernist novel Ulysses in Dublin and all the action takes place within a twenty-four hour period on the 16th June 1904. 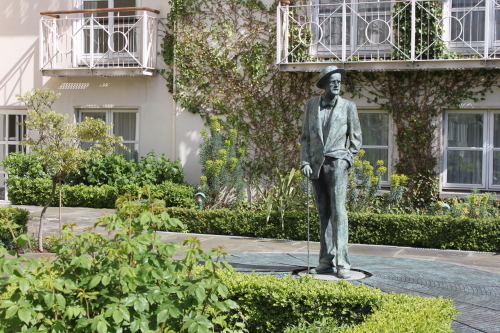 Bloomsday celebrates the book and is named after Ulysses’s central character, Leopold Bloom. If you are a tourist in Dublin today, you may bump into groups of people in Edwardian dress, speaking incomprehensibly. Fear not they are not crazed time travellers, just James Joyce fans reading aloud from Ulysses. This Bloomsday, Ulysses is meeting the 21st Century, when Stephen from Baltimore, with the aid of a band of volunteers, tries to recast Ulysses, through the medium of Twitter, over the same timeframe as the action of the novel. It is not an endeavour to tweet the book word for word but an attempt at a Twitter ‘translation’. The twitter account is @11ysses and there is further information on a related blog 11ysses.wordpress.com click here. Tweets start at 8 a.m. Under The LobsterScope, thank you for the pingback to my blog. Thanks Papillon Chouette for the pingback.